We don’t take road trips to Albion often. In fact, I can probably county on one hand the number of times I’ve been there for anything other than to get gas or a pop just off the highway. The last time I was in the small Calhoun county town for work I noticed a couple of things. 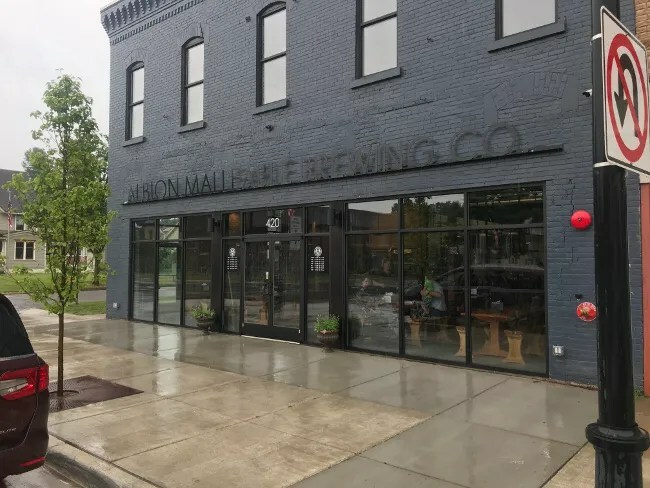 There was a cool looking children’s museum in the main business district and just down the street was a brewery that was a few months away from opening. Fast forward, that brewery is open. I’ve heard good things about it from friends who work at Albion College so we were hoping to get there. This past weekend was kind of a wash out and J asked what we could do that was indoors. I asked if she was up for a drive. We could eat lunch at the brewery then walk to the children’s museum for the kids. 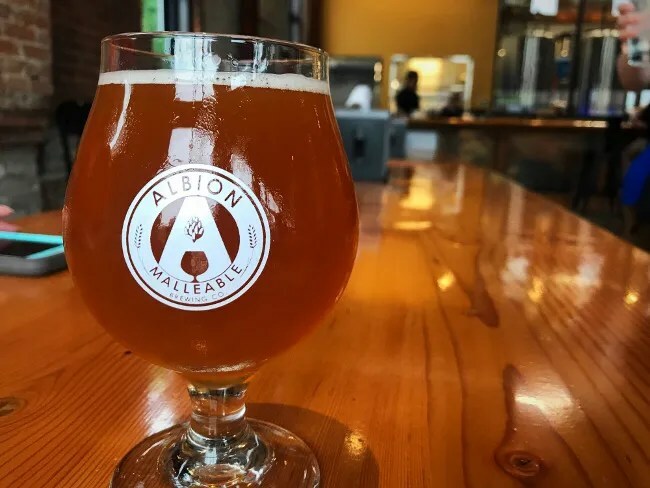 Albion Malleable Brewing Company opened up just a few weeks ago as Albion’s first brewery. The taproom is on Superior Street just south of Erie. The building is around a hundred years old and has been many things through the years. It’s been vacant for a couple now. The new owners put a coat of grey paint on the building and squared off the front windows to give the building a modern industrial look. The name Albion Malleable isn’t new to the citizens of Albion. Albion Malleable Iron Works was a major employer for the region for over a century. The factory closed in 2002. 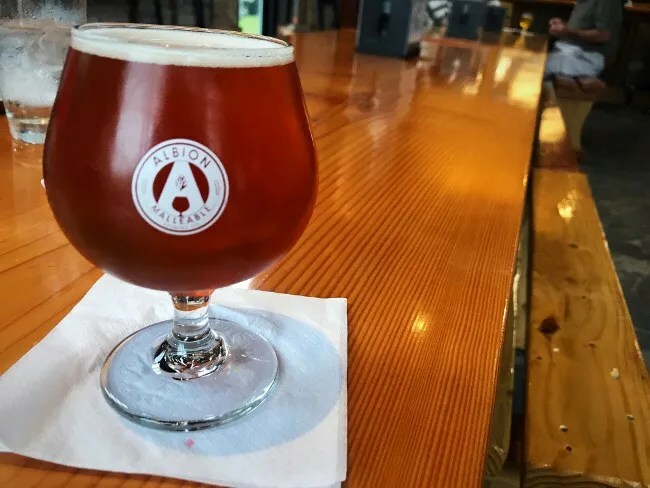 The brewery took the name and even designed the logo based on the factory’s logo. The interior design of the dining room really pays homage to the industrial history of the city. 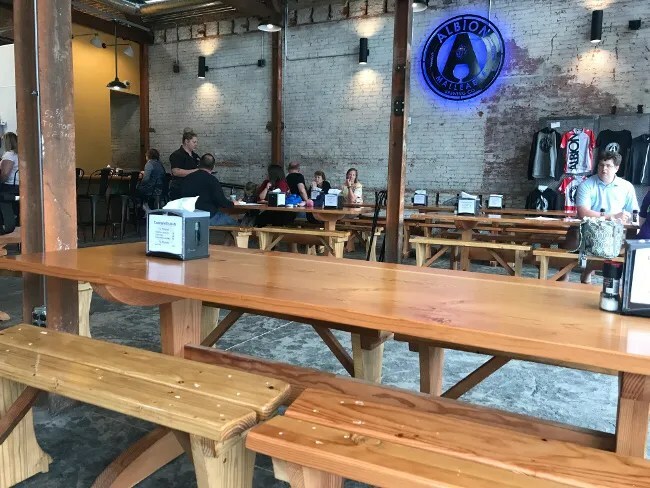 The exposed brick wall, high ceilings, and weathered steel support columns give the tap room a cozy, modern look. The brewing operation is visible through large windows behind the bar which just add to that industrial feel. We got to the brewery right around noon and were happy to see we weren’t the only ones walking in with kids. 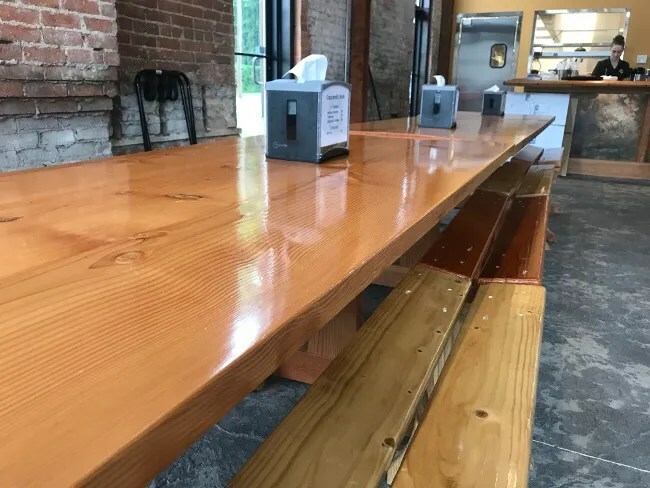 The custom furniture is rows of communal tables. We took a seat at an empty area in the corner hoping to stay away from people just enjoying drinks on this dreary Saturday afternoon. A waitress saw us sit down and came over with food and drink menus to get us started. I asked if they were doing flights and the waitress said not yet. She said most people were just order a number of the tasters and treating it as a flight. I decided not to do that and just ordered M-99 Problems. This is a juicy NE IPA similar to M-43. Superior Street through downtown is M-99 which is what the beer is named after. The similarity in style to M-43 is what drew me to this. It’s not nearly as hazy, but it has the same citrus-y flavor hidden behind the slight bitterness. They don’t have any ciders or fruity beers on the menu so there really wasn’t anything for J. She can usually go for a wheat beer if it’s citrusy but I didn’t see any of those either. 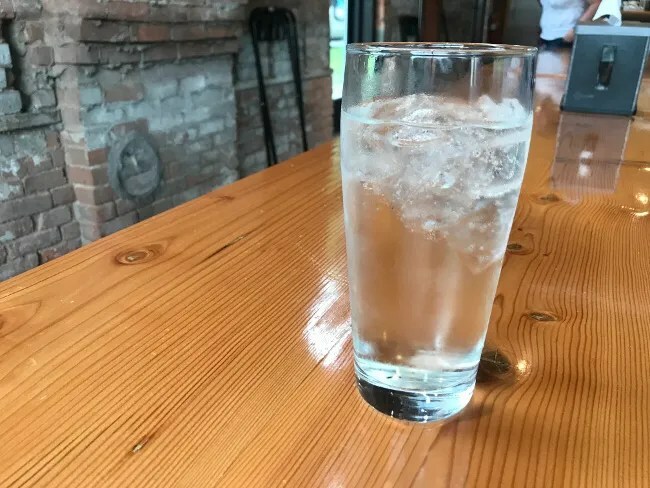 She instead ordered a Soda Water with Syrup. Initially she ordered the Violet but the waitress came back and said they were out of that one so she got the cucumber instead…and it really smelled like cucumbers. 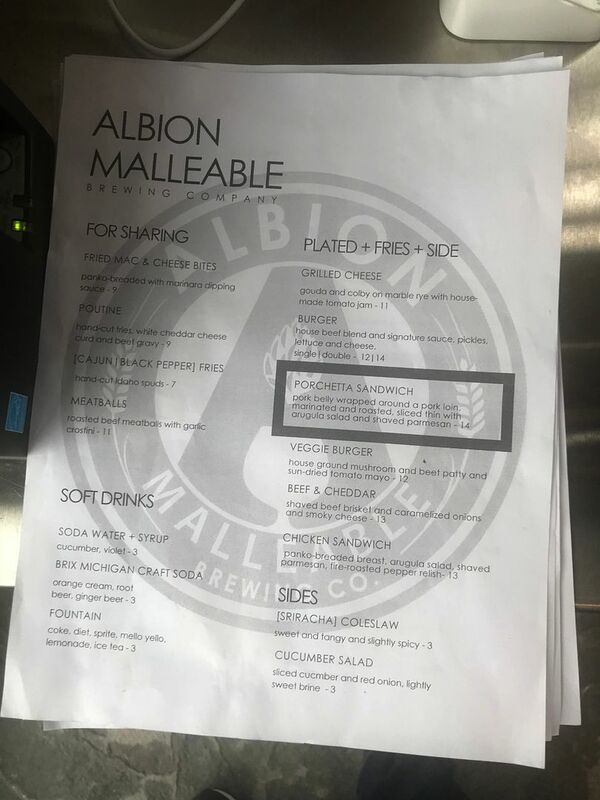 The menu at Albion Malleable isn’t huge. There are just six entree options alongside some appetizers. We started with one of those appetizers. 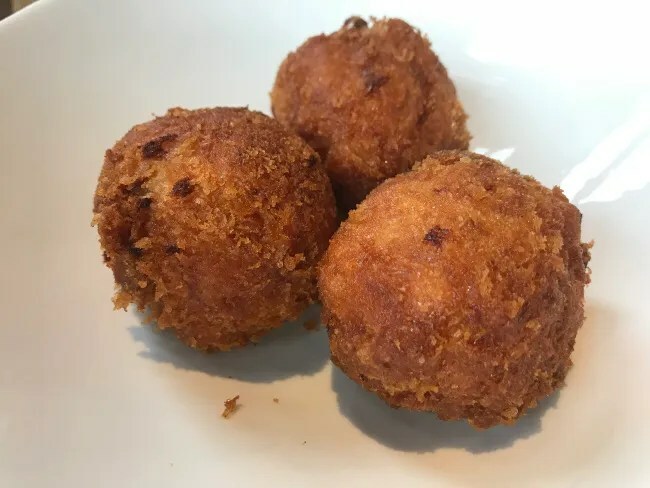 We got an order of Fried Mac & Cheese Bites thinking maybe the kids would eat them too. The plate is four large balls of mac & cheese surrounded by a crispy, golden brown breading with a side of marinara for dipping. They were really hot when we got them which is always a deterrent for the kids as they try to grab things right away then get angry when they’re hot. J and I both really liked them. The mac & cheese was densely packed into little balls and they were fried so it was super crunchy on the outside yet soft and steamy in the middle. 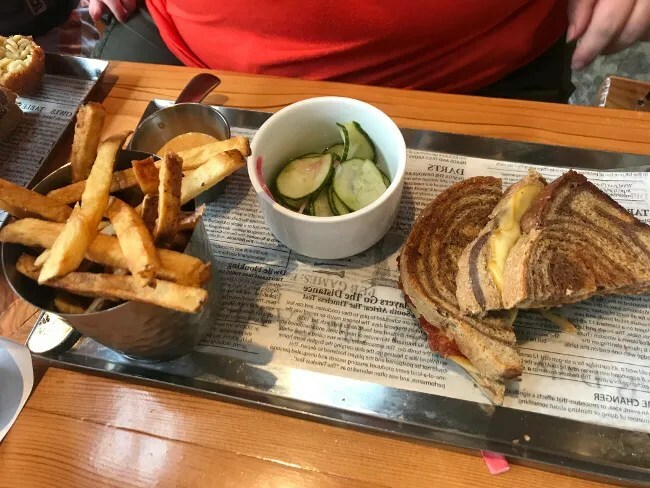 There was no kids menu but they did have a grilled cheese on the menu. J ordered one for herself and one for the kids to split. 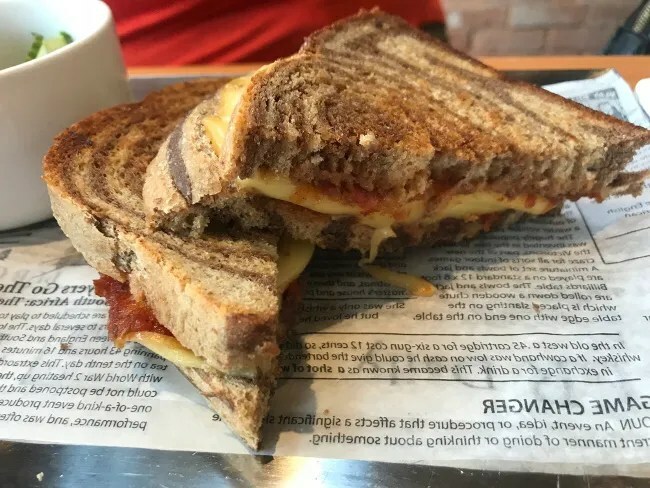 The sandwich is gouda and colby cheeses on a marble rye bread. There is also a house made tomato jam in there which J left off the kids’ sandwich but kept on hers. J loved the sandwich. She said the jam added a little bit of sweetness to the salty cheese but there wasn’t a lot of it and it wasn’t overpowering. The kids were a mixed bag. L wouldn’t eat it. She didn’t like the bread so we ended up fighting over lunch again. B had his half of the sandwich gone before either J or I even noticed he had picked it up and started eating. The sandwich came with fries and choice of a side. The two choices are cucumber salad or sriracha coleslaw. J got the cucumber salad for both of them and ended up eating both of the bowls as neither kid really gave it a chance. I ordered the Burger. The sandwich is a house beef blend with a signature sauce, lettuce, pickle and cheese. 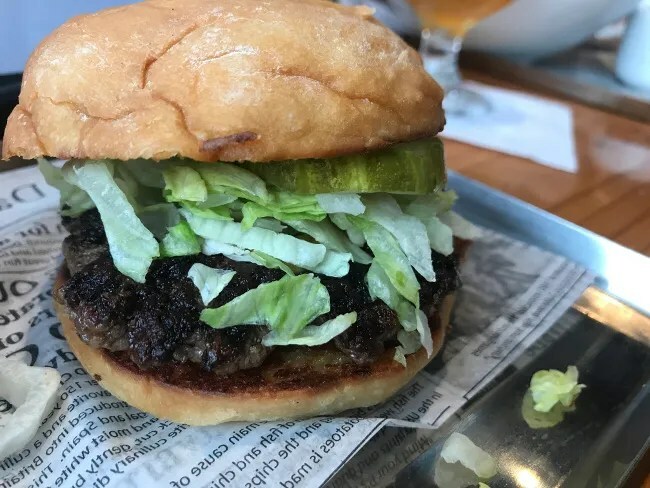 The simple burger was quite delicious. The meat was a loose pack that had juices oozing out of it. I actually left the sauce on and I’m glad I did. There was just a light spread of the sauce but on both buns. I assume it was some kind of spicy mayo as it just added a little bit of a kick without overpowering the flavor of the beef or the bread. The fries that came with the sandwiches were fresh cut, skin on fries that just held on to a little bit of the grease they were fried in. 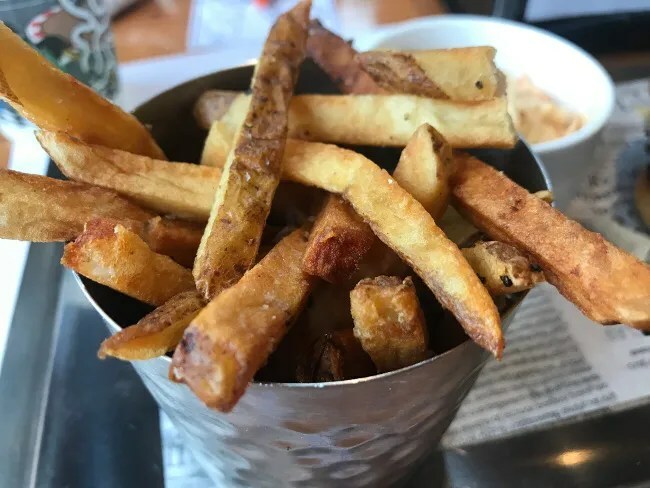 These are my favorite types of fries and Albion Malleable does a good job with them. It was the one thing that all four of us agreed on when it came to eating our lunches. I got the sriracha coleslaw for my side. I didn’t eat a whole lot of it because I don’t really like coleslaw…but I don’t like cucumbers either so I gave this one a try. 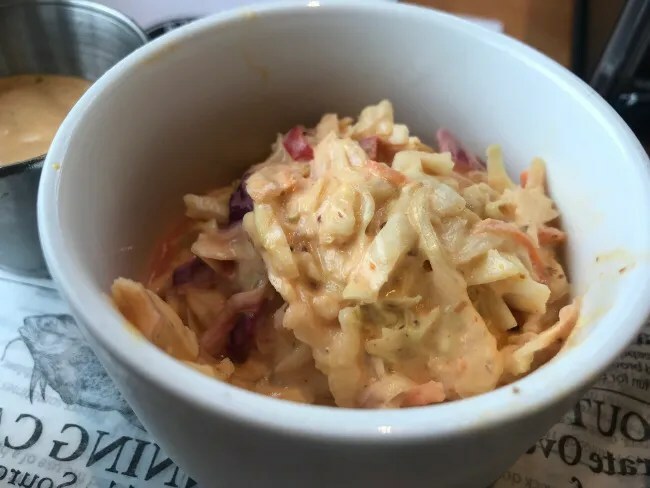 The slaw is pretty spicy. J took a bite and that was about all she could handle. I like spicy so I could have went a little longer as it did have a mostly sriracha flavor to it. I wanted to try one more beer before we left so as we were finishing up with lunch I ordered an Uncle Cousin. It’s another IPA offering but this one is in the Belgian IPA style. It was another tasty beer but the kids were getting restless and wanting to get down to the museum so I drank it a little faster than I normally would. Our bill for lunch was just under $65 so it’s a little pricey. I actually had to look twice because I wasn’t expecting it to be that much but we did order an appetizer and I got two drinks so that raised the price a little bit. 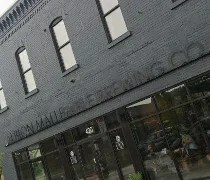 Albion Malleable Brewing Company is a great addition to downtown Albion. 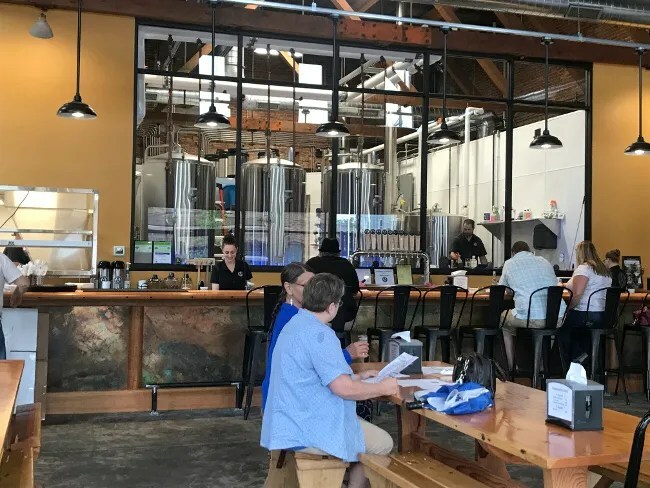 There’s a renaissance happening in the area right now and a brewery is the perfect addition. They have a solid stable of beers and they’re releasing new ones all the time. The food menu, while small, delivers a great meal to enjoy alongside the delicious beer.